Learning English comes more naturally for Monkey boy as compared to Chinese. This is mainly because he is growing up in a predominantly English speaking environment. From young I have always emphasized to the kids the importance of speaking properly in English when they lapse into Singlish. There is a direct relationship between written and spoken English. The way that one speaks will carry over to how words are expressed on paper and does affect the quality of the answer given. Books we use for polishing Composition Writing. In order to help prep Monkey for English this year I have been doing the following with him. 1. I’ve been introducing him to a wider genre of books which we borrow from the library- Fiction and non-fiction. We have touched on Science fiction classics like 2000 leagues under the sea, autobiographies , humorous stories and even the current kids favourites like the Wimpy Kid and Minecraft series books. It does help that I do a lot of book reviews. I have a large selection of books that I get to pick and choose from various publishers the latest published books which are suitable for the kids to read. 2. Focusing on creative writing and composition skills as this is one of his weaker areas. There many assessment books which can be purchased from the bookshop which can help with getting ample practice in the different types of writing formats. ( I have shown some of the books that we use in the pictures above). Going through these books with Monkey boy gives him a better understanding of the different ways of expressing his thoughts during composition writing. 3. Providing opportunity to practice every component of English. Even though Monkey boy is weaker in certain components like Composition and comprehension I make sure that he doesn’t neglect practicing his grammar and vocabulary too. If you look at the table above the areas which I have narrowed down the sections in which students lose the most marks. This adds up to a hefty 45marks which makes a difference between a Band 1 and a Band 2 for the overall English marks in Paper 2. Even though there are four options given above the student would need to understanding all the meanings of the options given to be able to choose the correct answer. The answer may seem straightforward for us as an adult but it could be confusing for the student if they have not been exposed to the word and have seen it being used in a similar context. Sometimes the options given in this sections can be very similar and leave one dumbfounded. 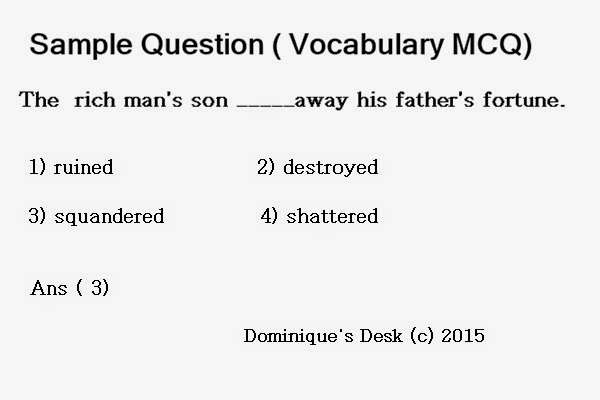 You just have to look at this question below to understand how important it is to for a student to have a good understanding of vocabulary. The full moon was not __________ to the observers as dark clouds had hidden it. Ostensible– stated or appearing to be true, but not necessarily so. The given answer in the answer key was (1). However based on the definitions of the words above it is possible to use the word Discernible in the sentence since the synonym given is Visible which is the answer for the given question. Technically either (1) or (4) should be marked correct if you are not following the answer key strictly and base the answer of the meaning of the words given. It can be confusing for both the marker and the student when such “bad” questions are set during an exam. Some more books that Monkey boy uses for revision. There is no easy way around this. It is only through practice that the student would be able to spot both the structural clues and contextual clues that are found in a passage. These clues are normally found in the sentences before or after the given blanks or may be in other paragraphs within the cloze passage. It is always important to start of this section by firstly reading the whole passage to capture the gist of the story being told. The student should fill in the blanks to the answers which he is certain of first before coming back to the section to attempt the other questions which he was unsure of. 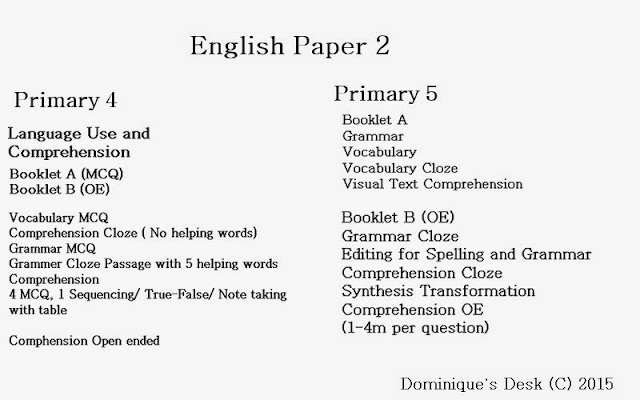 Now in Primary 5 it is not acceptable to just copy and write out the answers that is lifted directly from the passage. This method of answering the question in this section may have been suffice in lower primary but now it certainly won’t work if one is to score well in this section. What the examiner is looking for is how the student is able to FULLY understand what is being questioned and give a detailed explanation of why a particular event occurred. For certain questions the student would have to even show his train of thought by giving reasons on why he things that the statement given is “true” or ” false” . His personal opinion counts and he has to explain how he feels in the given scenario. Many of the questions in this section have multiple parts to answer and some of them may not be so clear cut. They may require the student to infer how the different characters are feeling and be able to analyse what is happening in the based on what is read. The student will have to join up the invisible threads present in the passage to draw up a conclusion before they are able to give a complete answer to the questions asked. This is certainly not an easy skill to master and can only be obtained through increased exposure and practice in this area.